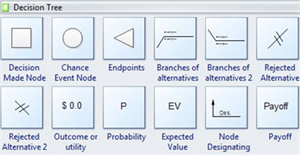 This tutorial provides guidelines in creating a decision tree, which help you get well acquainted with Edraw project management software. Decision tree is a decision support tool that uses a tree-like graph or model of decisions and their possible consequences, including chance event outcomes, resource costs, and utility, which is commonly used in operations research, specifically in decision analysis, to help identify a strategy most likely to reach a goal. With Edraw pre-defined decision tree template, one can easily create a professional decision tree in just minutes. 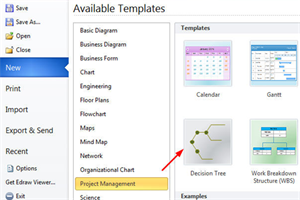 Open Edraw, on the start page click Project Management to find Decision Tree template. Double click the template to open a new drawing page. On the left of the drawing page, you can find all the shapes and symbols for Decision Tree in the library. 1. 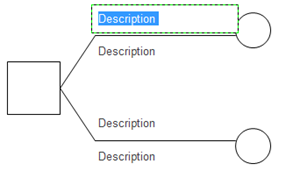 Drag a Decision Tree node to the left edge of the drawing page. 2. To change the node size, first select the node, then drag the green handles. 3. Double click the node to edit text. 1. The branch goes to the right direction. 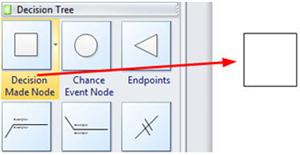 Drag a branch and approach the blue X mark appearing on the node, when it turns into a red mark , release your mouse, and the branch is automatically glued to the node, which means no matter where you move the rectangle, the branch shape will not separate from it. 2. Double click to add descriptions to the branch. 3. Continue to add more leaves to the branches. Add or change the fill color and effect. You can change the color from the quick access color bar at the bottom of the page or from the Home tab, Fill button. Read Fills, Shadows and Patterns to learn more about the fill function. 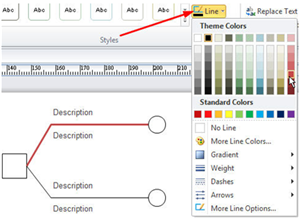 Select a branch to change the line format through Line Button under Home tab. You can set line color, weight, dash and arrow styles. Read Line and Line Ends to learn more about line setting. 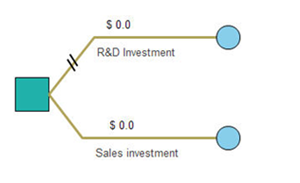 From the Decision Tree library, drag and drop corresponding symbols to the decision tree. Repeat the above process to add more branches and leaves, until every question has been resolved and an outcome has been reached. Here are some complete examples of decision trees created by Edraw.